If you have relatively healthy teeth, it’s easy to assume most other people have most or all of their teeth. But the Centers for Disease Control would argue with that. CDC statistics show that one-quarter of all Americans over the age of 65 have lost all of their teeth. That’s a lot of people. And if a person without all of his or her teeth opts to save the money and not replace them it can affect their lives in numerous ways. Of course, it’s difficult to eat a proper diet if chewing is next to impossible. Speaking is difficult. And it’s embarrassing, making a person avoid smiling or opening their mouth if possible. Plus, when a person is missing all of their teeth, the jawbone begins to erode and the body resorbs the bone matter. This leads to the eventual inward collapse of the lower face. But modern dentures are an effective way to replace missing teeth. We precisely measure and fit dentures for our patients at Prosthodontics of New York. Restored ability to bite and chew a wide variety of foods. Think of all the fruits and vegetables you can enjoy again! A more youthful appearance. With dentures, your teeth, gums, and jawbone are restored to their original dimensions. And your facial structure doesn’t collapse. Better self-image. No longer will you avoid smiling or opening your mouth. Clearer speech. You don’t realize the part your teeth play in speech, but it is dramatic. We offer full dentures or partial dentures at Prosthodontics of New York. 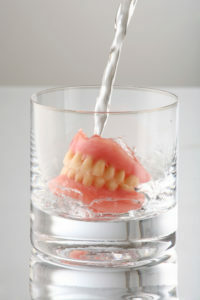 Full dentures replace an entire set of missing teeth, upper, lower, or both. Partial dentures are usually used to fill a gap of three or more teeth where a bridge won’t provide enough support. Materials range from acrylic to flexible resin. If possible, we like to incorporate strategically placed dental implants to anchor dentures. These are known as implant-supported dentures. Drs. Roberts and Sirota have extensive experience placing dental implants and are big fans of using implants to stabilize dentures. For full sets of dentures, we usually place four implants per jaw to anchor the dentures. The implants hold the dentures in place, no irritation or rubbing. No slipping when talking or eating. Food can’t get under the dentures. The implants direct bite force energy down into the jawbone below, slowing the rate of bone resorption that happens due to missing teeth. Implants provide the best stability for lower jaw dentures. If you’re missing all or most of your teeth, it’s time to stop suffering through the embarrassment and nutritional challenges. Call us at Prosthodontics of New York, (212) 758-9690, and set up a consultation for dentures. Do You Need a New Smile for 2019?